Vera was adopted from the Whatcom Humane Society. She had been chained in a backyard and badly neglected and mistreated for her first 1 1/2 years, and then had been at the Whatcom Humane Society for the next 6 months where she became excessively kennel stressed. She was somewhat fearful of people but generally well adjusted. However, she rapidly learned that she could keep those things she was fearful of at bay by reacting. This behavior escalated and her owners worried about her growling at people and lunging and barking at any dog within 50 feet of her. Even going to a new location was very stressful for her. She developed some obsessive behaviors that were difficult to deal with. 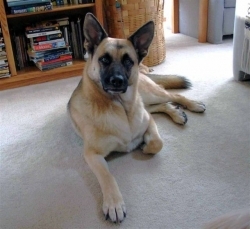 Her owner has had a lot of experience with dogs and had trained dogs for 20 years. So for two months she worked daily with classical and operant conditioning, and attended a conference on reactive dogs. They applied what they learned. Vera improved but very slowly. When I first met Vera, her body language was that of a shy/fearful dog, unsure of herself and her surroundings. After evaluating Vera and starting her on a customized treatment program, she quickly improved. After just 14 weeks, she was ready for Level One, Reactive Dog Classes. By this time she had mastered fast movements, close proximity to teacher and strange dogs, worked in a labyrinth with other dogs, had protected contact, grazing experience, xpen experience and even played one on one with teacher dog. Her reactivity decreased dramatically, as did her obsessive behaviors. It was her body language change that was amazing, from a shy/fearful slinking look to one of cool confidence – happy. While the treatment strategy is key, it is very important to mention the dedication of her owners, trained professionals who undertook and completed the learning plans as they were designed to be done. This compliance has led to a successful rehab of a beautiful dog worth saving. If they hadn’t done this, Vera would have been euthanized. "We started taking classes with Diane 2 1/2 months ago. Her calm, confident, non authoritative manner was perfect for Vera and she rapidly bonded with Diane. With Diane’s insight into dogs and their behavior, she gave us confidence in Vera’s potential and gave us many ideas on how to manage Vera’s obsessions which, as she promised, have now all but disappeared. She was able to give us very concrete direction in how to manage the pack dynamics when Vera and Lola, our golden, had a scary confrontation (we have a collie in addition). We can now manage pack barking and play confidently using only positive interventions. Vera is at a point now where she is friendly and eager to meet any stranger we introduce her to. We no longer worry about her growling or snapping at strangers." Level One, Reactive Dog Classes are by invitation only to dogs with a long history of feeling safe at a proximity of 5 feet from dogs and/or people. They have had to prove they are ready to be in a challenging class situation limited to four dogs. This is the milestone to the next level in rehabilitation of the reactive dog, called Peaceful Transformations. Vera accomplished this quickly and without complication. Customized Learning Plan: Multi-dog Consult; Tellington Touch Method of Training to include bodywork, and higher learning coursework for Extreme Dogs. Clicker training and cues mastery; stimuli desensitization and counter conditioning; distance work; class study. Diane, you are truly blessed to have such a gift for understanding dogs and being able to help them. I am amazed and awed and so grateful for your help with Murphy.